i have the aristo 2jzgte ac compressor with my 7mgte compressor head but when i go to slide the compressor on the long stud on the back side it hits the relief valve on the 7mgte head. did you guys encounter this problem? 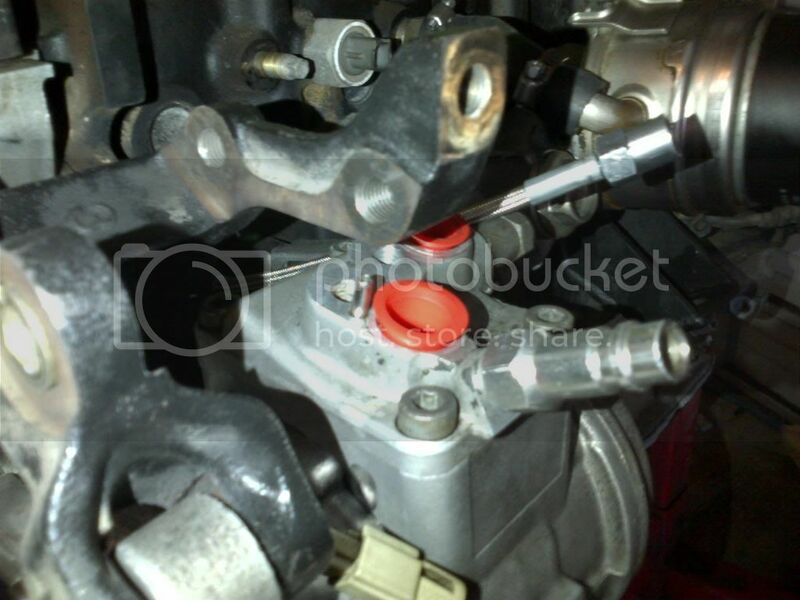 would i just remove the relief valve or remove the stud? dont really want to do the relief valve cause i dont my compressor to blow up. I think i just used a bolt or installed the valve after the i put the line on. It was 1 of the 2.
yea i think a bolt would be better cause the stud is still goning to hit the relief valve after i take it off and try to bolt it on . thanks though and what part of the bracket do you need to grind again to clear the ac line? You will see when you put it on. Iirc you might not need to if you put the bracket on after the ac is together bit idk for sure. Iirc thats the general area you have to grind. Use bolts instead of studs and put the lines on first and then bolt on the ps bracket. I just finished the AC on my Aristo VVTI 2jz and here's some notes. The compressor on mine was totally different. Take a look - aristo has that big head - If I had to do it again I would consider getting new hoses and stay with the aristo stock pump. So I got a Denso compressor that fits a USA 1995 supra. 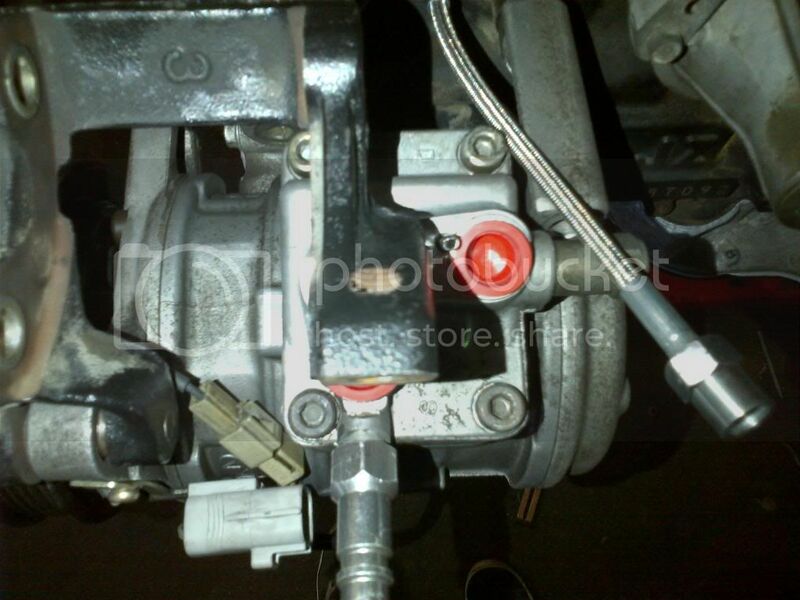 The ac housing has the VVTI bolt on pattern correct, belt pulley correct, and the manifold bolted right on. Next came the business of grinding the bracket. Here's what the final grind looks like. I went a bit overboard. Also replaced the bolts with smaller heads. If I do it again I know I don't have to go into the threads so much. You definitely need the oil pressure extender hose for oil pressure sending unit. There's a stud on the top rear of the compressor. You won't be able to use that because the relief valve is blocking it. I chose to not use this stud. I wanted to use the stud on the bottom but it won't clear the driftmotion power steering hose elbow. I was able to use the original long bolt. It can be inserted while the engine is in because there's cutouts on the back of the pump that give you the angles you need. After that it all bolted up well. Also the driftmotion hose has the elbow exactly 180 degrees wrong on the solid black hose. Otherwise it's a great product. I ended up sending it to the back and coiling to the top. It will work. Here's pics of the bolt which worked. and a pic of the stud interference. The AC hoses are a tight fit too. Some mild bending is needed right where the driftmotion oil pressure sensor hose is. Yes..... Just take a grinder to it. It's what I did.